Coronini Palace was built between 1593 and 1598 by Carlo Zengraf. He was Secretary of the Provincial States of Gorizia and the House of Habsburg granted him jurisdictional, civil and penal powers on a vast area to the north of Gorizia. 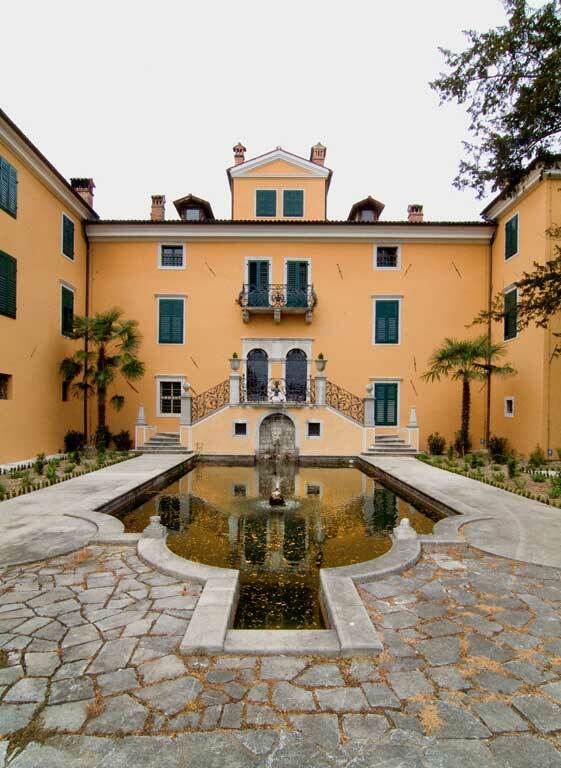 The palace is located in the outskirts of Gorizia and was designed according to the severe and strict criteria of a blockhouse, surrounded by high walls with little scope for anything regarded as unnecessary. Following the recent restoration works (2002-2006), some ancient walls have been discovered: probably the palace had been superimposed to a previous tower structure, with a surface of about 8,5 x 10 meters, that was apparently built with the purpose of controlling the northern part of the city. The design of the project was attributed to the military architect Giulio Baldigara. 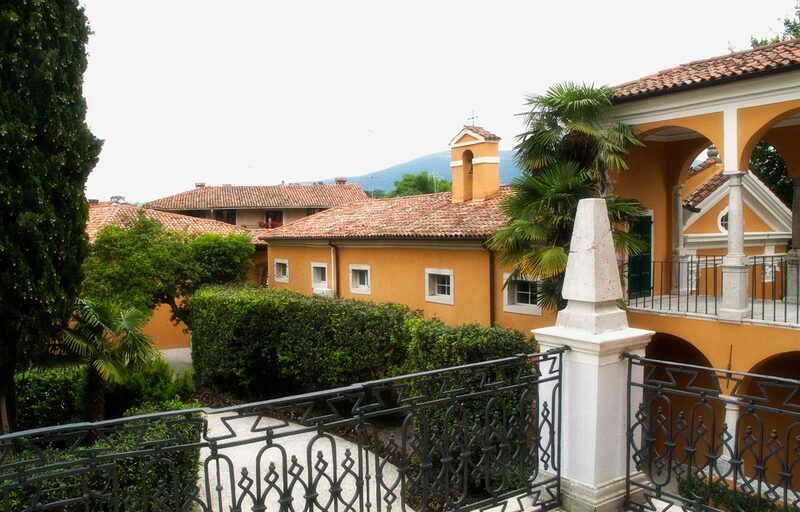 At that time he was active in Gorizia as archducal architect, and his name – together with that of Alessio di Gradisca – can be found in the valuation dating 4th September 1614 for the sale of the property to Riccardo di Strassoldo. Zengraf’s death as well as sudden financial difficulties forced his son Raffaele to sell the property, already known as Grafenberg, to the Strassoldo Family. They were responsible for the significant changes made to the Palace, in line with the idea of a manor house. First of all, a single-nave Chapel was built near the main building around 1640. The Chapel, dedicated to St. Anna, is linked with the Palace through a double loggia. Between the 17th and the 18th century the stables were built on the edge of the property: after the restoration works they have been used for conferences, expositions and as a warehouse. Two other buildings were constructed to be used by the peasantry and for agricultural purposes. The chancellery was added near the Chapel and is now the seat of the Foundation Offices. At the beginning of the 19th century, the damages caused by the Napoleon Campaigns as well as some family problems within the Strassoldo Family resulted in heavy financial difficulties that brought about the loss of the Palace. On 7th October 1820 all Grafenberg’s real estate as well as the jurisdictional rights were put up for auction and bought by Count Michele Coronini Cronberg (1793-1876). Since 1833 the property had undergone massive refurbishment: an adjoining wing of about 20 meters was added to the front of the building in order to expand the complex. Count Michele Coronini’s family took up residence in the first and second floor, while much of the third one housed their rich book collections. In October 1836, shortly after the completion of the refurbishment works, the last Bourbon King of France, Charles X, decided to leave the small village near Prague, where he was in exile, and take up residence at Coronini Palace. Part of his Court stayed at Coronini Palace, while some of them moved to Strassoldo Palace in St. Antonio Square (now seat of the Grand Hotel Entourage). Charles X’ stay in Gorizia was short and unlucky because, less than one month after his arrival in Gorizia, he contracted cholera and died. He was buried in the Franciscan Monastery of Castagnavizza/Kostanjevica (now in Slovenia), just few kilometers from Gorizia. 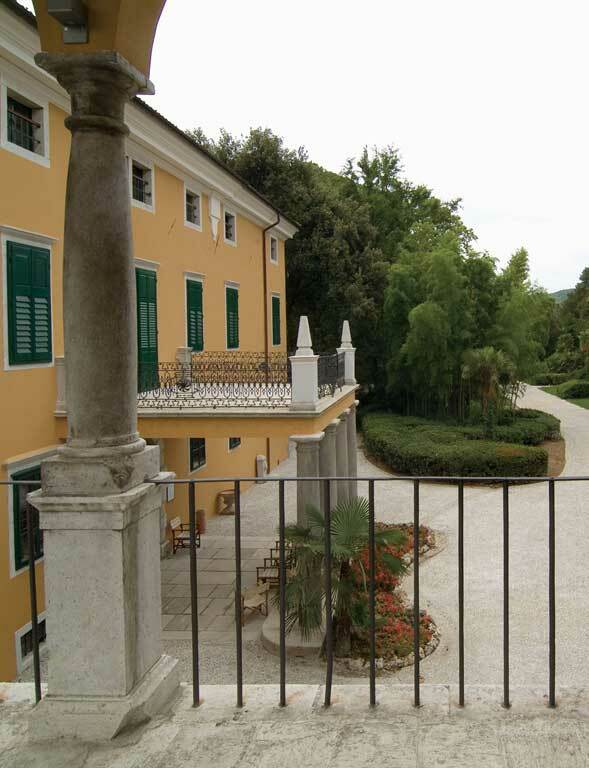 At the beginning of the 20th century, Count Carlo Coronini (1870-1944) gradually succeeded his father Alfredo (1846-1920), who was Count Michele Coronini’s nephew, to the management of the family assets. 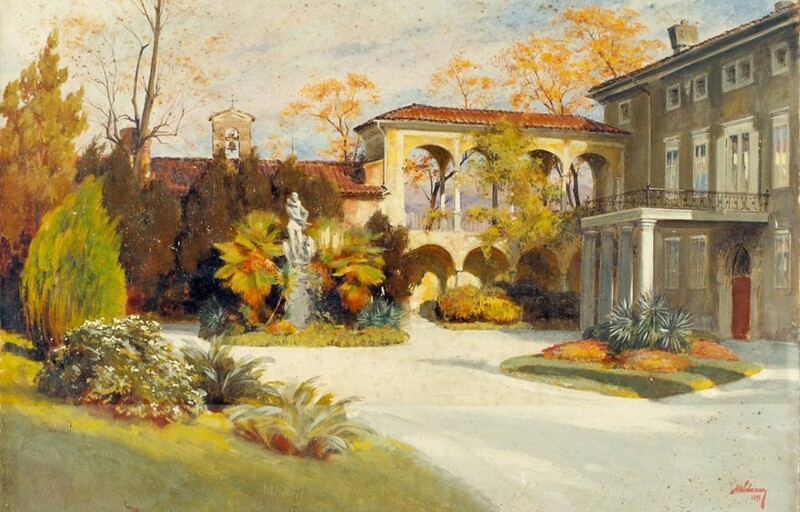 After 1918 Count Carlo Coronini begun a massive reconstruction of the estate, seriously damaged during the First World War. In 1915, Count Carlo Coronini, his wife Olga Westphalen von Fürstenberg (1868-1958) and their children Nicoletta (1896-1984), Francesco Giuseppe (1899-1964) and Guglielmo (1905-1990) moved to Wöllan Castle (now Velenje Castle, in Slovenia), property of his relatives Adamovich, in order to seek refuge from the war. On the other hand, his father Alfredo and his mother Carolina Ritter de Zàhony (1850-1928) went to Salzburg. During the conflict the Palace was heavily damaged by artillery bullets: its reconstruction begun shortly after the end of World War I and initially involved the main building only. The refurbishment of the Palace, the Chapel and the loggia started on 27th May 1919 and went on until late 1923. On 6th November 1922 the Palace was listed by the Ministry of Public Education of that time as being of historic importance. 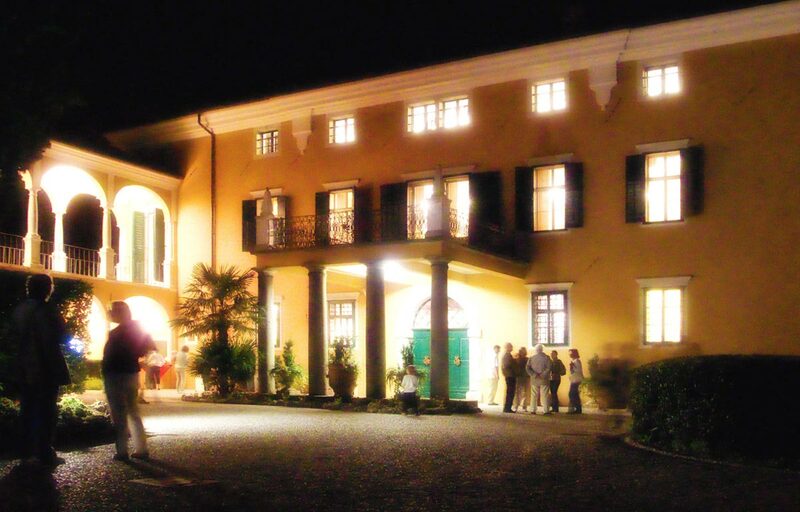 Between World War I and World War II the Palace was rented and became seat of an Italian Army unit, while after 8th September 1943 it was used by the German troops that occupied Gorizia. At that time huge changes were made to the Park: an outdoor pool was added in the rear of the Palace and the main entrance was erected, using stones from the damaged Villa Attems of Piedimonte. The Palace was later occupied by a Yugoslav partisan unit, followed by the allied troops. Only at the beginning of the 1950s the Coroninis could return to their Palace, where they finally settled.From then on Count Guglielmo Coronini started thinking about transforming the family residence into a museum, with his sister Nicoletta always at his side on the project. His dream came true after his death, occurred in Vienna on 13th September 1990.